In a case clouded by stereotypes and a typical government defense of haplessness, the Court majority cut to the heart of the legal question at stake: the Border Patrol, regardless of its sweeping powers over aliens, does not have jurisdiction over U.S. citizens. The majority writes: "here, the Agents concede they knew R.M.G. 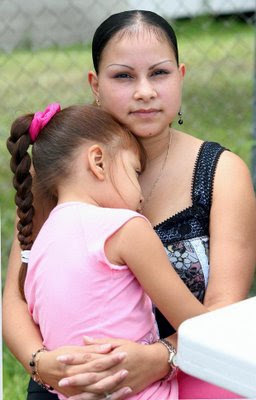 [the child] was a U.S. citizen" (p. 18), and hence they may be sued for acting outside the scope of their authority. This decision cites a number of precedents on the relevance of the FTCA to the abuses of U.S. citizens by agencies in the Department of Homeland Security that apply to fact patterns in many other cases similar to this one, several of which I have described here (see esp. tags for David and NationArticleFacts). Indeed, the only unusual fact here is the custody dispute between the noncitizen father, who had R.M.G. in his custody when he was deported, though Monica Castro was also present and had alerted the Border Patrol to her daughter's U.S. citizenship and Castro's claim for custody. In other words, in many other cases DHS agents have clear evidence of U.S. citizenship without distracting custody disputes, which should make suing the government even easier in those instances. As I've mentioned before, this model of using the FTCA to curb government abuses is a third-best option. It does not punish the individual agents and it does not attack the roots of the border's absurdity and the resulting prejudices. The charges of false imprisonment and, essentially kidnapping, at the heart of Castro's suit deserve the attention of U.S. Attorney Generals. Once the agents realize the results of their abuses could be prison time, and not just an increased tax burden for the rest of us, then they might show more judgment and restraint. And even this is the second-best option. The wisest policy for ending the border crimes of noncitizens and DHS agents alike would be to allow free movement. The image above is from the Caller-Times. Homeland Security has managed to procure $1 billion in the stimulus package for devices that could detect bombs in checked luggage. Considering that absent this technology airplanes are not dropping out of the skies due to bombs in checked luggage, and knowing that spending $1 billion is not a guarantee the technology and people using it will work in the future, isn't this a colossal waste of money? Now that the Obama administration has, for the first time, identified economic fragility as posing the world's greatest security threat to the United States, it seems logical to complain that not only is the spending on this stupid, its wastefulness and especially the opportunity costs of not spending the $1 BILLION dollars on programs we know would be useful, e.g., education, public transportaion, health care, programs for supporting immigrants... the expenditure is also heightening the threat to homeland security. Tonight I ended up watching the 30 minutes of "Ask the Prime Minister" session recorded last Wednesday. Prime Minister Gordon Brown was being asked to renounce not only capitalism, by one Labour Party Member of Parliament, alert to the ideology's recent difficulties, but also, by another, to insist that Israel allow humanitarian aid into Gaza. 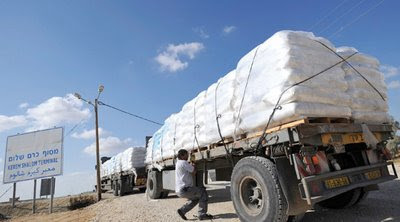 Before making this request, the MP, I don't recall his name, explained that by preventing lorries carrying medical supplies and food from reaching Palestinians in Gaza, Israel was violating international law. The speaker described in some detail the devastation Israel caused during its bombing, and insisted on the importance of Israel allowing entrance into Gaza of lorries driven by United Nations and other human rights workers. It reminded me of how odd it is that a member of the U.S. Congress would never publicly press President Obama on Israel. The British Prime Minister replied by saying that he had written a letter to the Israeli Prime minister requesting that Israel immediately allow the lorries entry. The need to instruct on simple vocabulary revealed in form the differences in substantive political intelligence between our Congress and the British Parliament I had been watching. CASA de Maryland, an immigrant rights group, on January 28, 2009, released video footage taken by 7-11 cameras showing ICE agents literally rounding up patrons in and outside the store based solely on their appearance as Latino. The link to the video, taken in Baltimore in 2007, is here and you might want to start around 2:45, which is where the events in question are most visible and, at 3:10, you see the ICE agents marching three customers out of the store and sitting them on the curb alongside several others similarly detained. The video makes two points very clear: 1) ICE initiated contact with the individuals; 2) there is absolutely no "probable cause" or grounds for "reasonable suspicion" other than the illegal motive of racial profiling. Even more troubling than the initial violation of these people's civil rights is the subsequent cover-up of the ICE agents' illegal activities. According to the CASA attorney Justin Cox, an ICE internal report quoted ICE agents stating that they were approached by the individuals they detained. Cox explains that the agents told the ICE investigator that they "happened to stumble on these people who volunteered that they were in the country with no immigration status." Many of those detained of course were citizens or legally in the country. The CASA attorney also noted that the investigators who conducted a review of the raid did not interview a single one of the individuals ICE detained. Hardly a sign of an unbiased investigation into civil rights violations. "Those who were targeted were the individuals who were congregating and who had approached the vehicle. Obviously, I know there were allegations of racial profiling, those allegations are two years old, more than two years old now. They were thoroughly investigated at the time. That investigation found those allegations to be unsubstantiated." The video footage renders this statement demonstrably false, as you can see individuals being taken from the store, not near a truck, and also herded AFTER a white pickup truck leaves. "In this case our officers used their training and experience to respond to a developing situation as it unfolded. They were approached by individuals asking if they needed workers. Those workers were questioned and ultimately it was determined they were in the country illegally." Again, it is obvious that the only situation that developed occurred because of ICE agents acting illegally. Best wishes to CASA de Maryland in its wrongful arrest lawsuit under the Federal Tort Claim Act. I hope they win every penny of the $500,000 damages they're claiming on behalf of their three clients. Still, defending civil rights and punishing government coverups shouldn't be left to private individuals and non-profit groups. It's time for the Department of Justice to step up on behalf of not only wrongfully detained US citizens and residents but also the U.S. taxpayer. It's one thing to have the US government, not the agents themselves, pay out millions of dollars in lawsuits, as has happened. If a few ICE agents were imprisoned for their crimes, including lying to a federal officer, which is what appears to have occurred when the agents told ICE investigators about what transpired, perhaps then ICE would pay a bit more attention to the laws and the U.S. Constitution. On February 13, 2008 Zoe Lofgren (CA-D) chaired a very important hearing before the House Judiciary Subcommittee on Immigration, Citizenship, Refugees, Border Security, and International Law. The hearing brought forward several U.S. citizens and public interest attorneys, including Kara Hartzler, Rachel Rosenbloom, and James Brosnahan, who testified about ICE violations of the rights of US citizens, as well as resident aliens. In addition, Gary Mead testified rather pathetically on behalf of the Department of Homeland Securities. The link to these hearings, which includes streaming video, changed over the last year and became hard to find, so for my own records if not those of others, I thought I'd repost the link that presently works here. During the hearing, the members asked several questions that Mead said he would answer in writing. In August, 2008 the Subcommittee received those responses, which are included in the final Subcommittee Report, Serial No. 110–80, beginning on p. 130. These responses are quite enlightening for their statements that in the interior ICE bears the burden of proving someone is not a US citizen before detaining that individual; ICE does not qualify this by citing foreign birth. Also noteworthy is the preference of seeming stupid instead of culpable, in responding to specific allegations of abuses by stating that ICE would be responsive to specific allegations of abuses and then not responding. During the hearing Mead would not state what constituted a "brief" period of detention and ICE was asked to comment on this in writing. "Subcommittee Question: Does detaining one of our witnesses, Mr. Mike Graves, and hundreds of his co-workers in the Swift plant in Marshalltown, Iowa for eight hours constitute a 'brief' period? Response: ICE is unaware of any instances where United States citizens or lawful permanent residents were detained for eight hours during the worksite enforcement operation conducted at te Swift and Company plant in Marshalltown, Iowa. ICE takes such allegations seriously and if the committee has information regarding any such instances, we ask that the information be provided to facilitate an investigation." Of course ICE agent Gary Mead sat within several feet of Mike Graves, who gave specific testimony about this precise set of events, and this, and the other witness testimonies, also were available in writing during the period in which ICE was responding to the Subcommittee questions. [The ICE agents] asked me questions about my identification and asked me about my parents. And I said they lived in Mississippi. He asked me do I know my route to Mississippi. And I said, well yeah, but I don’t know the exact route in detail. So he kind of looked at me and told me to sit down. So he took my identification to another agent that was down from the aisle where I was sitting and told me to sit down. And he looked at my identification and the other agent did, too. They looked at it, said something to each other, and started laughing. of the cafeteria and told me to go in there and wait——We was in there for about, at least, 3 or 4 hours in the cafeteria with no food, no water, no means of telephone to call our lawyers or—they did not give us a chance to get our union rep there to talk to us about the situation either. 400 yards to another building where 400 people were in there where they still cut off all our food supplies, no water, no phones, no nothing. We were there for about 8 hours with no means of getting outside contact, no food or water till the whole process was over and done with. This report includes extensive media and non profit organization documentation of ICE law-breaking.